Oscor's Angios Classic Angiography Catheter - 100 Series, contains one catheter per box. Oscor's Angios Classic Angiography Catheter Kit - 300 Series, contains three catheters per box. Oscor's Angios Classic Angiography Convenience Kit - 400 Series, consists of a three catheters kit, a fixed core guidewire L - 150 cm OD - 0.035", and an Adelante® Sigma dilator and sheath plus guidewire L - 50 cm OD - 0.035". 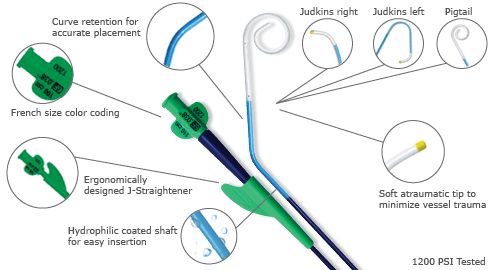 Featuring a proprietary HD braid reinforced shaft offering maximum pushability while retaining excellent curve stability, maximum flow rate during contrast injection, and an ultra soft radiopaque catheter tip to minimize vessel trauma. Oscor’s Angios Classic diagnostic angiography catheters are available in a variety of curve, size and length configurations. Other custom angiography catheter convenience kit configurations available upon request.